Gathering and recycling your aluminum cans is great for the environment, but not so much fun. YouTuber Grant Thompson, also known as The King of Random, experimented with more than 10 prototypes to come up with a simple, inexpensive (and super-duper dangerous) backyard foundry. He uses it to melt soda cans into make aluminum ingot, which he then pours into a sand mold to create a cool cast aluminum toy. The foundry is composed of sand, plaster, and a galvanized steel bucket. It can be used the same day you make it, and all told the project will cost around $20. When it isn’t being used, it can be cleverly disguised as a flowerpot on your patio. Thompson plans to release a tutorial showing how to make the foundry. 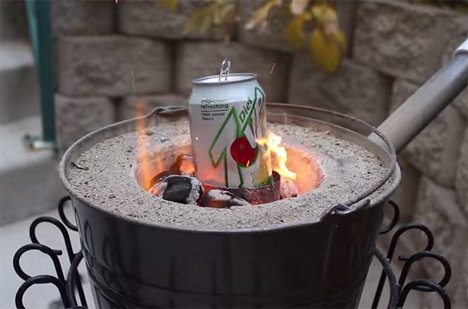 In the meantime, this video shows the foundry in action melting soda cans like they’re ice cubes. Seeing the process in action is inspiring for extreme DIYers who want to make impressive things at home but want a slightly more hands-on approach than 3D printing. Thompson points out that aluminum cans are easy to use and readily available, but they’re one of the worst sources of aluminum to cast with. Major safety precautions should be taken if you’re planning to try building your own backyard soda can foundry. See more in Do It Yourself or under Technology. January, 2015.